Photo by Rich L. Wang on Flickr Click on it for a larger view. After the huge success of the High Line in Manhattan it is no surprise to see this underground park in an abandoned subway terminal (disclosure, it's really an old trolley terminal). My irresistible pun is "Are these plants sub-irrigated?" They are...but probably not. I am looking forward to vising this project and blogging more when I get back near the city in the spring. Stay tuned. Rich has more good photos like the one above on his Flickr Photostream. See thousands more. Looks like a Broadway hit to me! "Waiting for the lowdown on the low line." This project from Designboom made my eyes pop. Wow, these are arguably the best indoor Ficus trees I have seen in a long time, maybe the best ever. Then I read that the project is in the U.K. and that they imported the trees from the Netherlands. Mystery solved. The Netherlands is head and shoulders above the rest of the world in horticultural expertise. If I could only make just one call or email to get advice about an interior plantscaping problem or design challenge it would be to Kenneth Freeman in the U.K. He is one of the most knowledgeable interior plantscapers I know in my long experience in the field. He is an executive with Ambius, a subsidiary of Rentokil Initial plc a U.K. corporation. Ambius is the largest interior plantscaping company in North America. When I saw the photos of these fabulous Ficus trees and noted that they were from the Netherlands, I immediately thought of Kenneth. I well remember his comments long ago about superior interior plant quality in Europe. He said that they had access to plants that are not available in the U.S. Seeing is believing. I doubt that there is a grower with meticulously groomed Ficus trees like these even in Florida, certainly not in California. These trees are obviously not growing in dim light that causes problems for top-watered Ficus trees in homes across the U.S. You can see the lights overhead in this view. The night shot below really emphasizes how bright the light is. I am wondering about irrigation of the trees. It is very possible that they are planted in clay pebbles using the system called hydroculture. I will make an effort to find out and update this post. See a link to the Designboom article below. This photo brings back memories from the '70s when ferns were hanging everywhere in bars and restaurants. The only thing missing are macramé hangers. I had to rub my eyes when I saw this photo. I picture this restaurant full of 60ish ladies having tea. My interior plantscaping company used to service all the Hyatt Hotels in Southern California. Hyatt designers loved ferns in their Daisy's Kitchen restaurants (I think that was the name). Ferns were a big pain. They constantly dropped fern petals on the tables. I remember one time I was filling in for someone at the Hyatt Anaheim. I was standing on a ladder and looked down to see Phil Rizzuto sitting at the table. It was a double header pain! Ferns and a NY Yankee. I was a died in the wool Brooklyn Dodger fan from way back. For you younger folks, Rizzuto was a Hall of Fame shortstop for the hated Yankees. At the time of the fern encounter he was a baseball announcer. “Botanic Kitchen firmly drags garden centre restaurants into the 21st century 20th century with a fresh contemporary look while championing home-grown ingredients and seasonal flavours,” commented Kiwi & Pom director Emma Young. “It delivers the garden on a plate.” (edit. including fern petals). With a brief of bringing the “joy of the garden” to its food and beverage offer, the UK’s biggest plant and garden-focused retailer was looking to consolidate and refurbish its existing restaurant offer, while delivering a step change to consumer expectations in this competitive sector and attracting a wider-ranging demographic. This historical photo from the Shorpy.com blog this morning triggered some significant memories related to both my interior plantscaping and IBM careers. To begin, the lobby has some tried and true interior plants of the last hundred years or so. The Sansevieria trifasciata plants in the planter I can live without but they are still around. Their common crowd-pleasing names are "snake plant" and "mother-in-law's tongue". Horticulturists are such marketers. Back in the day, most bars came equipped with spittoons and snake plants. Women need not enter. The palm in the background tells a very different story about the history of indoor plants. It is a Howea forsteriana known as a Kentia palm. I view it as the Mercedes of interior plants, Mother Nature's finest work. If there was just one indoor plant, this is it in my opinion. Kentia palms represent timeless beauty, the epitome of gracefulness. The delicate arch of a Kentia palm frond is embedded in my vision of plants inside buildings. Unfortunately, money hungry growers flooded the market with cheap Ravenea palms known in the mass market as "Majesty Palms". They are anything but majestic. To the untrained eye, they look like Kentia Palms but behave like your drunken brother-in-law. They are cheap in every sense of the word. My advice is to please not buy them but it is probably too late. The video below is about the demise of the venerable Keeline-Wilcox nursery that was once the world's largest Kentia palm grower. I have known Richard Wilcox for many years and was saddened when I heard the news. It was an awesome business as the video shows. The "Newark Athletic Club" lobby was the design of Morris Lapidus, a famous hotel and retail store designer. I had the great pleasure of listening to him reminisce about his long career at the New School of Architecture in San Diego. Morris has passed on but much of his work still stands. His hallmark project is the Fontainebleau Hotel in Miami Beach. It was there that I attended my first IBM 100% Club. It was a memorable experience to stay in this fabulous hotel of the time. Miami Beach was then still in its heyday before affordable jet travel changed the vacation world. Now there are mostly condos. Comedian Buddy Hackett characterized the post-glitzy Miami Beach" condos as being God's waiting rooms. Edit 09-20-14 - Curbed posted some great photos of the Fonainebleau Hotel from back in the day. There is more to say about Morris Lapidus and the "Newark Athletic Club." The club eventually became the Military Park Hotel (gone now) where I attended my first IBM training. We came back to our classroom from lunch on Friday, November 22, 1963. After a wait, our instructor finally walked in. He told us that President Kennedy had been shot. Our class was ended for the day. That memory will never fade. The era of 1950's post-war euphoria was over. Video and graphics from National Indoor Plant Week website. I wonder how may urbanites became long-term houseplant growers from this giveaway program. Did you know that this is the first day of National Indoor Plant week? You did not? Shame, shame. I just found out from a Google Alert. Do you see "Easy to grow" on the list to the left? Most people have an inate liking for the natural world and plants (see last item on list). However, no one likes to kill houseplants which is easy to do with recommended finger poking and "drench and drain watering". The result is that most mainstream Americans have stopped growing indoor plants. The visual evidence is in the daily photos in my research. Maybe there is a vase of real or artificial cut flowers in a photo, but no living plants! Most "green thumb" houseplant gurus have killed more plants than they can remember while learning the arcane drain hole based "drench and drain" methods taught by horticultural educators. Teachers include USDA "master gardeners", extension educators and garden writer accolytes. Why do houseplant growers avoid teaching consumers about sub-irrigated planters (aka SIPs, known erroneously also as "self-watering planters")? They avoid sub-irrigation like the plague because houseplant grower business plans are based on consumption rather than sustainability. It is that simple. Plant death is desired rather than long life. What is even more interesting is that most houseplants are grown using some form of sub-irrigation including ebb and flow, capilary mats and flood floors. Based on past history, greenhouse growers will likely never tell consumers about sub-irrigation, even though sustainability and water conservation are hot topics. Further, most established commercial interior plantscaping companies (a business I was in long ago) also use sub-irrigation. They will not tell either due to fear. Their fear is that clients will switch to sub-irrigation based self-maintenance. False expectations appearing real. Back in the '70's and 80's all of our interior plantscaping customers knew about our use of sub-irrigation. It was written in our contract documents. The business prospered because they respected our use of modern technology. When I think of this industry I remember an old expression from my IBM days..."No guts, no glory!" Tell the truth and consumers will follow. The postponed houseplant workshop at Brooklyn Botanic Garden is on for next Wednesday, December 5 from 6 to 8 p.m. The workshop features the use of sub-irrigated planters (SIPs), the most foolproof way to maintain plants indoors. Everyone will take home a recycled soda bottle SIP with a starter plant. There are a few seats left but you better hurry. Register here. To support the event, I will post houseplant information between now and the workshop. First, the term houseplant. In my view, it is an old-fashioned term. I’ll use it because it is in such widespread use. Think about some of the uses of the word such as “dumb as a houseplant”. Indoor or interior plant is more modern. I draw the line, however, at “self-watering”. It is bad English and makes no horticultural sense. Only animals with a brain have the ability to start and stop drinking. Plants do not have this ability. The term self-watering instead of sub-irrigation leads all too often to over watering and plant death. 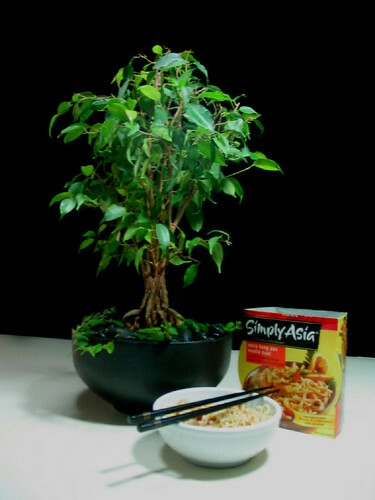 Learn how to grow a bonsai style Ficus tree like this one. It's growing in a ceramic rice bowl with no drain hole. Imagine that! 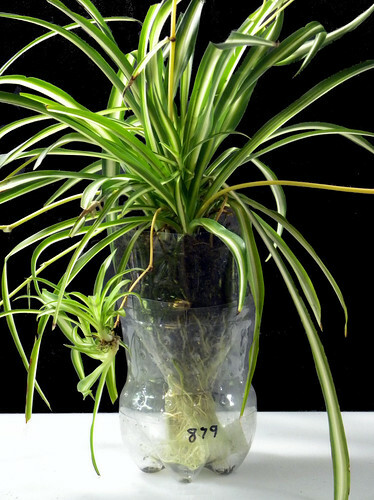 A Spider Plant growing happily in a recycled Coke bottle SIP. Sub-irrigation is really a form of simple hydroponics. See the water roots? There is still space for the sub-irrigated planter (SIP) workshop at Brooklyn Botanic Garden on Wednesday evening. It is sponsored by the BBG GreenBridge program and it's free. Also, everyone will take home a plant in a soda bottle SIP. If you grow a large quantity of plants indoors, using either soil based sub-irrigation or clay pebble based hydroculture (particularly if fan-assisted) there may be some benefit regarding air filtration of volatile organic compounds (VOCs). If you grow houseplants in drain hole pots in the traditional (but incorrect) way, any air filtration benefit is dubious to doubtful. Claims to the contrary are in the category of junk science. Watch the following videos and you will see that this does not stop those with a vested interest in promoting it as good science. The broad term "NASA research" giving implied endorsement of houseplant air cleaning means primarily a now retired NASA scientist by the name of Bill Wolverton. The objective of his testing was to explore growing plants in space ships. He did his testing in enclosed test chambers not open rooms as we have in our homes and offices. The interior plantscaping and houseplant industries discovered Wolverton’s research and are primarily responsible for blowing this research all out of proportion. They seized on it and established the Plants for Clean Air Council, a marketing initiative. We know what the media is capable of doing with buzz-worthy information like this and they did. Aided and abetted by the notoriety he received, Bill Wolverton went on to write a houseplant book titled How to Grow Fresh Air: 50 Houseplants that Purify Your Home or Office. Read this prior post What Did Bill Really Say? Incidentally, the book is now ranked No. 217 in the Amazon “houseplant” category. Fifteen minutes of fame has obviously passed. What does the Environmental Protection Agency (EPA) have to say about houseplants and pollutant removal? Over the past few years, there has been some publicity suggesting that houseplants have been shown to reduce levels of some chemicals in laboratory experiments. There is currently no evidence, however, that a reasonable number of houseplants remove significant quantities of pollutants in homes and offices. Indoor houseplants should not be over-watered because overly damp soil may promote the growth of microorganisms which can affect allergic individuals. Also read a PDF by the EPA, entitled Care for Your Air: A Guide to Indoor Air Quality. A search will reveal no hits on either “plant” or “houseplant” (singular or plural). Once again, the Latin admonition caveat emptor "Let the buyer beware", prevails in the consumer horticulture field. The new Edmonton International Airport expansion opened yesterday, February 11. This video animation from 2010 does an excellent job of highlighting its new features including a 2-story, 98 foot (30 meters) wide hydroponic living wall by Stantec (Canadian architectural firm). The living wall, along with other passenger-friendly features, is very cool indeed. Have a look and you will see the living wall both near the beginning and the end of the video. Read more (and view a news video) about the terminal here. Time flies too. Did you know that the Denver International Airport is the only major airport to be built in the United States in the last 25 years. It opened 17 years ago in February, 1995. How are we ever going to find the political will and the funding to update our aging infrastructure in the divisive political climate we live in? We better figure out the answer soon or we're all in big trouble. I have time to take a bus. Busy business people do not have that luxury. Neither does our economy. Joel Jarvis of St. Thomas poses for a recent picture with the 1,487-pound squash he grew on his farm. The gourd breaks the old Guinness Book of World Records title by more than 200 pounds. Will someone please authenticate this photo. I doubt that it was Photoshopped but you never know in these digital days. It was interesting to read that Joel is an interior plantscaper. I firmly believe that this is one of the best ways to learn about growing plants in the urban built environment. Growing plants inside buildings is always a challenge but it's a great way to learn. Interior plantscapers water more plants in a day than most houseplant hobbyists do in a month. Hobby gardeners would learn a lot about plant light/water relationships if they had an interior plantscaping work experience. The job doesn't pay a lot but it's a valuable intern experience. 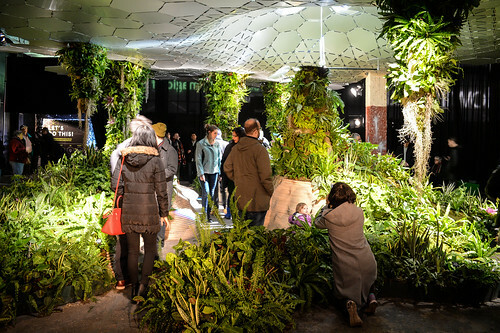 When coupled with some higher education in plant science and horticulture it can lead to a rewarding career as a modern day urban greenscaper. Just don't listen to the drain hole and dirt only dudes and divas. While Jarvis’ day job with London Interiorscapes helps funnel his love for growing, he’s yet to have any requests for creating anything too out of the ordinary. Joel Jarvis knows his way around super vegetables. He’s been growing them since the ripe age of 11. Jarvis, who puts his green thumb to work daily in Forest City office buildings, recently plucked a 1,487-pound squash off the vine at his hobby farm. The gourd trumps the old Guinness record by more than 200 pounds. There’s a lot more to cultivating gargantuan vegetables than just planting the seeds and watching them grow, Jarvis said. It can be a painstaking process that requires constant vigilance.